A great advancement was made in the area of Acids and Bases when Bronsted and Lowry proposed in 1923 a new concept which is independent of solvents. According to them, an acid is defined as any hydrogen containing materials (a molecule or a cation or an anion) that can release a proton (H+) to any other substance. Whereas a base is a substance (a molecule or a cation or an anion) that can accept a proton from any other substance. 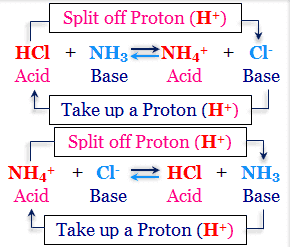 In short, an acid is a proton donor and a base is proton acceptor. A neutralization process is therefore involved a release of proton by acid and the acceptance of proton by base. Neutral compounds or even ions could be designated as acids or bases according to this concept. When an acid release a proton (H⁺), the residue must be a base and this base can take up a proton (H⁺) to form original acid. Thus acid base neutralization involved two acid or two bases, thus forming conjugated pairs. Thus, a conjugate base of an acid is that part left after the proton lost. Similarly the conjugate acid of base is the species formed on the addition of proton to the base. In the above reaction HCl donates a proton to H₂O and is therefore an acid. H₂O on the other hand accepts a proton from HCl and is therefore a base. In the reverse reaction which at equilibrium proceeds at the same rate as the foreword reaction, H₃O⁺ ion donates a proton to Cl⁻ ion, hence H₃O⁺ ion is an acid. Cl⁻ ion, is a base because it accepts a proton from H₃O⁺ ion. The members of which can be formed from each other mutually by the gain or loss of proton are called conjugated acid - base pairs. A conjugate base of an acid is that part left after the proton (H⁺) is lost. Similarly the conjugate acid of a base is the species formed on the addition of a proton to a base. An acid exhibits its acid properties only when it is allowed to react with a base. Similarly a base displays its basic properties only when it exposed to an acid. Name the conjugate acids and the conjugate bases of HX- and X.
Conjugate acid of a species is the one that is obtained on the addition of a proton and conjugate base of a species is one that is obtained on the release of a proton. In the above reaction HX- acts as a base and its conjugated acid is H2X. In this reaction HX⁻ acts as an acid thus its conjugated base is X-2. In the same way conjugate acid of X-2 is HX- but X-2 cannot have any conjugated base because there is no proton that can release. Thus CH4 has negligible acidic properties, but NH3 donates a proton more to strong base to from NH2-, H2O loses a proton even more readily and HF is a fairly strongly acid.